Last week, Lilya Kas'yanova, one of Kyrgyzstan's finest guides, provided an overview of the yurt and how it is used in Kyrgyzstan today. This week she describes how Kyrgyz age-old yurt traditions are still practised and how to assemble a yurt step-by-step. 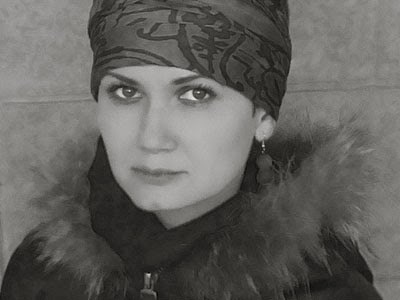 Lilya, who regularly leads Uzbek Journeys tours in Kyrgyzstan, will contribute occasional articles about her areas of interest. Yurt frame manufacturing became a specialised occupation of craftsmen. 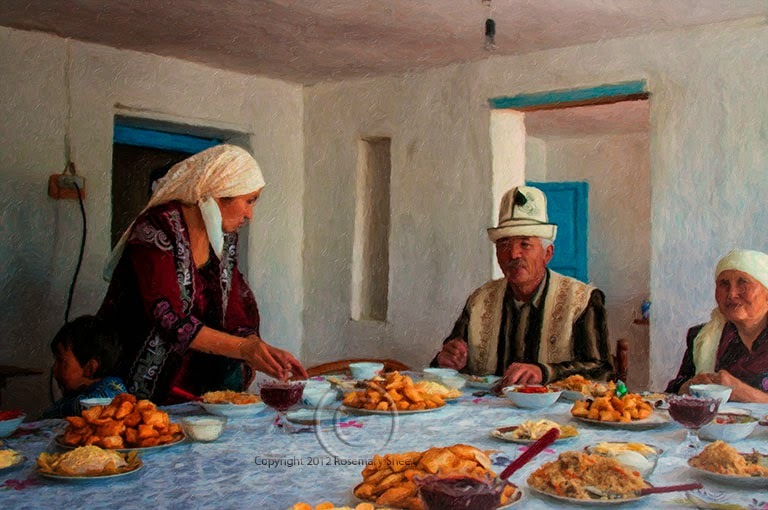 In the Kyrgyz language, the terms uichu or usta (for men) and uzdar (for women) designate "master". That these terms are applied to yurt makers indicates the regard in which they are held in Kyrgyz society. The most renowned and skillful yurt makers reside in the Issyk-kul region of Kyrgyzstan. Their expertise is recognised all over Central Asia. For instance, gifted Mekenbek Osmonaliev, who lives in Barskoon village, is the director of a one-of-a-kind workshop. Why is it so unique? 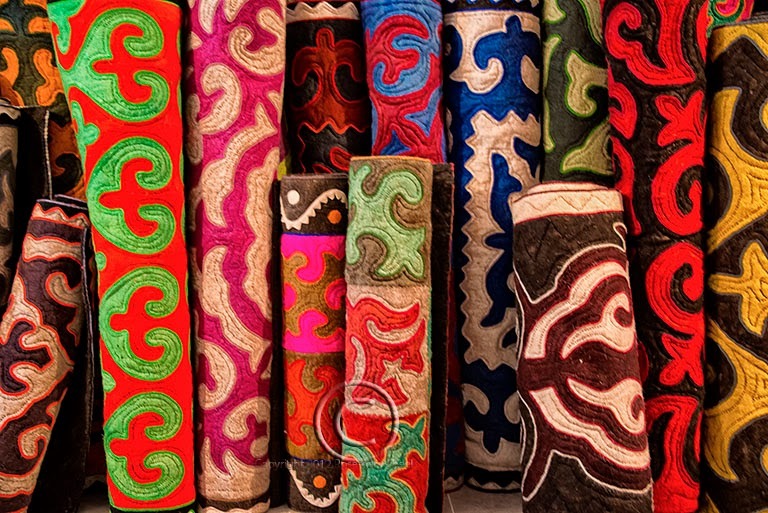 Because in addition to distinctive yurt frames, Mekenbek and his talented team of 15 handicraft workers produce kiyiz (yurt cover felt), a variety of gorgeous felt carpets and interior design items, and even cane furniture. At the South Shore of Issyk-Kul Lake, there is another remarkable place – Kyzyl-Tuu – a village of yurt makers. There are 1500 people (430 households) who live in this village and almost all the adult residents are engaged to some extent in yurt making as well as the production of yurt interior decorations. Yurts are generally manufactured during summer. Tal (willow) wood is used for the frame. This willow variety is considered to be solid and durable and less susceptible to decay. Yellow wood is preferred as it is the colour of the sun. Kazakh people size their yurts by kanats and tend to say: three, five, ten or twelve kanats yurt. The walled circle, which is built up by the kerege is linked by the bosogo – the door frame. The eshik (folding door) is hinged onto the door frame. usually said: that it is sixty uuks yurt, etc. The major part of the yurt is the tunduk – the round, central, roof element. Tunduks can be hung with chachyk - colorful tassels – and garlands that anchor uuks and assure a balance weight. The tunduk is a symbol of Kyrgyz statehood and adorns the distinctive flag of the republic. One more component of the nomadic dwelling is chii , the reed screen that covers yurt walls. Chii create an insulation layer that makes the yurt livable in the cold season and it also adds a decorative element. 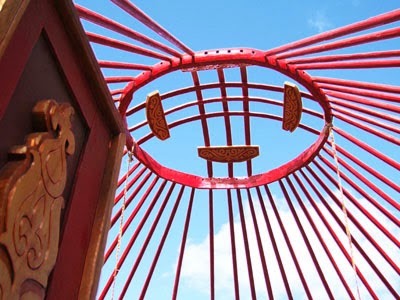 In the Mongolian yurt, however, reed screens are usually not used. In winter, Kazakhs apply two and sometimes three layers of chii,and fill the space between them with straw. Kiyiz (thick felt) is used as an outside, protective yurt layer. Kiyiz, depending on the type of livestock bred in the region, can be of different colours. 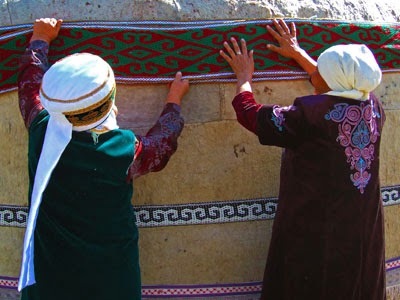 The kiyiz of Turkic yurts is usually grey or white, rarely black, as the Turks use sheep wool generally. In Mongolia, it can be sheep, yak or camel wool, thus yurts vary in color also. For interior insulation and decoration special mention should be made of ala-kiyiz (felt carpets with rolled-in patterns) and shyrdaks (mosaic, thick, felt stitched carpets). Both carpet types both pave the yurt floor. the left of the entrance is the er jak – the men’s side that is marked by horse harnesses, hunting equipment, craft tools, hunter’s trophies, etc. the right side (epchi jak) was reserved for women. It represents the household area and is richly decorated by sophisticated carpets, wall hangings, containers and embroidery pieces. Hers is also the kitchen, formed by the ashkana chii, which separates the cooking area from the rest of the yurt). The space opposite the entrance is the warmest in a yurt and on special occasions honoury guests and the most respected people are seated. The sacred kolomto (fireplace) is located at the very centre. Cleverly, the yurt's circular shape ensures draught formation, and any smoke from the kolomto rises towards the tunduk (central opening). With this knowledge of a yurt's constituent parts, we can now consider the steps of yurt installation. Different nomads set the yurt's entrance based on one the following directions: south, south-east or east. The easterly direction prevails in the Kyrgyz culture, however, a yurt door can be oriented southward, according to the Mongolian tradition. A yurt is placed on an elevated spot to observe the locality and keep an eye on livestock. In days gone by, the yurt served as calendar and clock: time was determined by the point of the sun beam that came in through the roof opening. Next the kanats trellis wall sections are set up and fixed by cords. 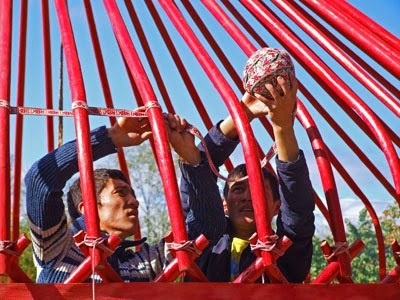 The upper part of the assembled kerege (trellis walls) is adjusted by a special cord, the kerege tangych. Then the tunduk (central roof-piece) is raised up by means of the ala bakan (special pole). Immediately upon tunduk raising, the roof assembling is started. The top part of uuks (cupola beams) are set into small holes on the sides of the tunduk, and the bottom of the uuks are fastened on the trellis wall. On completion of the cupola beams installation, they are securely fixed by uuk tangych (narrow bands). The jabyk bash (a broad decorative piece) is attached inside at the bottom of cupola. Kanat chii (reed screen) is placed on the trellis wall. Tuurduk felt is laid on the kanat chii, and uzuk felt covers the yurt's cupola. The felt coverings are fixed by woven stripes - tuurduk boo and uzuk boo. The final stage is covering the tunduk by a rhombus-shaped piece of felt, known as tunduk jabuu. You are now ready to assemble your own yurt! On an Uzbek Journeys tour to Kyrgyzstan you will visit Mekenbek's workshop as well as the yurt-making village of Kyzyl-Tuu. There are also opportunities to lunch in yurts.